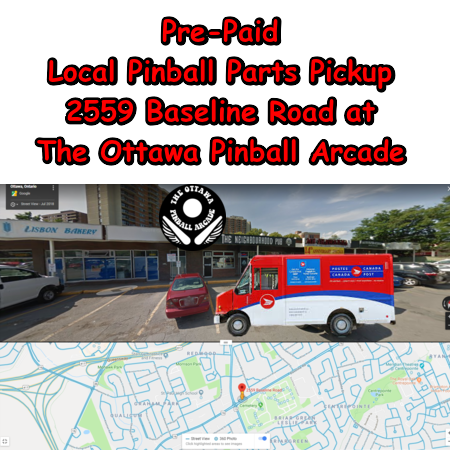 Pinball Medics has reinstated local parts pickup at the Ottawa Pinball Arcade 2559 Baseline Road inside the Neighbourhood Pub. Simply select the items you wish to purchase, select “PRE-PAID LOCAL PICKUP” as the shipping method, and pay securely with any major Credit Card, or Paypal, and you will be notified by email when your order is ready for pickup and waiting for you at the Arcade. In stock parts will generally be ready for pickup within 24 – 48 hours, and you will be notified promptly if any of the parts in your order are out of stock. Free automated shipping quotes are given on our site with our integrated Canada Post A.P.I. system, and it is still a great option locally. A typical order in the Ottawa, Gatineau, Montreal, Kingston, Cornwall, Toronto area costs no more than $13.00 – $16.00, and is often delivered within 24 hours! Once you have added everything to your cart, proceed to checkout. Once you fill in your address, the shipping quote will appear above the payment options. If you decide to go ahead, select “Regular Parcel”, and proceed to pay securely by Credit Card or Paypal. We upgrade all Regular Parcel to Expedited Parcel at no additional charge, which includes tracking and $100.00 insurance. You will be notified by Canada Post as soon as a shipping label is created, and tracking information will be available the moment your parcel is in the hands of Canada Post, who will send updates on the status of your parcel to the email address provided during checkout.